By looking carefully at the comments of the examiner's mark sheet, we can get a good insight into the ABRSM marking criteria thus helping you to get a better mark in future exams. Let's analyze it section by section. First piece - A bright and stylish tempo with a good sense of pulse and played with even tone and contrasted dynamics. Briefly "something" (even I cannot decipher this word so if anyone can help please let me know in the comments below) rhythm only. You will notice that there is nothing in this comment about playing the correct notes, but rather, how the tempo, tone and dynamics resulted in a bright and stylish performance. The character was well conveyed at a confident tempo with well controlled and contrasted tone. Even so, this piece still got a very high merit mark. If any of you saw to my post from last week, you will remember that I mentioned how many students come out of the exam remembering just the wrong note or two they may have played and then think that the whole thing was terrible. A flowing and well chosen speed for the style. Hands were consistently well balanced and it was fully accurate in notes, with well contrasted dynamics. One slip in the broken chords but otherwise all fluently played with even tone at a musical speed. A slightly hesitant ending, but otherwise fully accurate at a musical speed with firm pulse. ...and may I add that in their marking criteria for Aural tests the ABRSM official guidelines mention that they are looking for confident rather than hesitant responses. You could lose marks, even with the correct answer if you answer hesitantly. 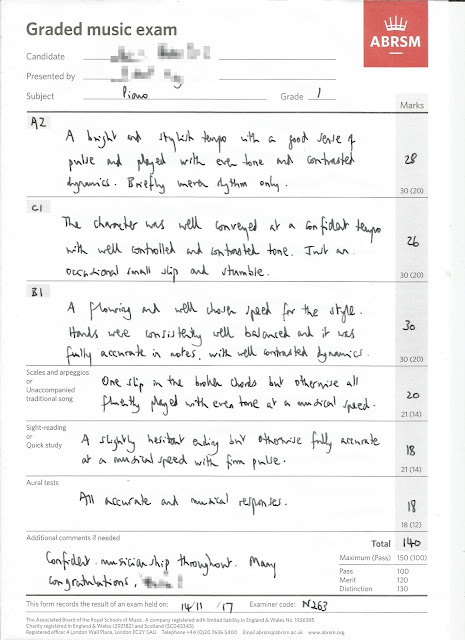 So I hope that was an interesting journey through an examiner's mark sheet. Maybe you would like to dig out one of your recent ones and let us know in the comments below some of the things mentioned that might give other readers more of a clue what they are looking for and how to get a better mark in a future exam. Feel free also to use our new FORUM to start any music education related discussion and you can even share with us your recent exam successes there.